Bio: Manisha Thakor serves as the vice president of financial education at Brighton Jones, one of the nation’s most innovative and rapidly growing wealth management firms. With the firm’s support, she is launching her true WELLth podcast in mid-February 2019 that will help people shed the flawed equation that wealth = happiness by giving them tools from a wide range of experts on how to redefine success and craft one’s own definition of true WELLth. 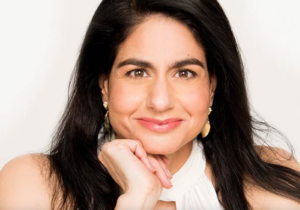 Manisha is a Harvard MBA, CFA, CFP, as well as an author/speaker/teacher with extensive national media experience. Visit MoneyZen.com for a full listing of Manisha’s impressive accomplishments over her 25-year career. WOW factor: “Simplicity, Small Joys, Financial Independence.” I wrote this down on a napkin as I was flying back from spending a year abroad studying at Oxford University 1990-1991… reflecting upon what I’d learned and what I wanted to use as the core anchors for my life. 28 years later, those three touchstones remain the same and have helped me at points of confusion, overwhelm or crisis… more easily identify (even from a list of really sub-optimal choices!) what next step would bring me back closer to those guiding principals.